It's been a year since the rains of typhoon Ondoy inundated much of Metro Manila. My second daughter's high school even had to look for another school venue because all the roads towards their school were flooded. Typhoon Ondoy brought a month's worth of rain in a couple of hours. The metrowide flooding prompted the utility company to shut off power and there were massive blackouts. It took quite a while for the floods to subside and the sun to shine. Laundry piled up and I had to wash the car floor mats due to mud. In the aftermath, there were plenty of felled trees and I managed to take home tree branches that I cut for firewood. Talk about opportunity in a calamity. 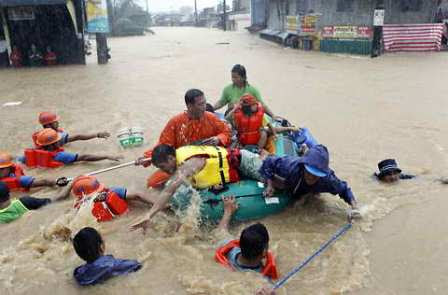 Since Tropical Storm Ondoy caused severe floods last year, the PCG (Philippine Coast Guard) has been training residents, volunteers, and local officials from Metro Manila, the Bicol Region, and Northern Luzon on search and rescue operations. "There were volunteers sent to us for training but when we over-turned the rubber boat in the pool, it turned out that they did not know how to swim," Lt. Cmdr. Armand Balilo of the PCG said. "If you know how to swim, then there is a chance for you to succeed. You may get the training on search and rescue but if you don’t know how to swim, patay (you’re dead)." 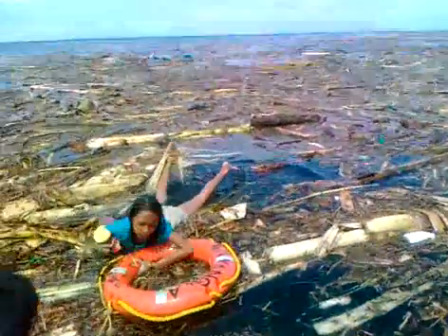 Another glaring example was Typhoon Sendong where it was discovered that many drowning victims did not know how to swim. "About eight persons die every day due to drowning and that more were reported to be victims of near drowning (10 cases per day)," said a Philippine report. I couldn't emphasize it more that disaster preparedness needs to be hammered down and drilled into a person's head. A 72-hour survival kit, especially, may prove to be invaluable for disaster-prone areas. And for quite a long time, I've been espousing the value of swimming. This blog actually came about in that realization. In this blog, I've written my top ten reasons for taking up swimming and even pointed out an interesting news article by the BBC. I also wrote and delivered a couple of Toastmasters speeches in that regard. In the speech "Learn to Swim", I elaborated how swimming is fun, how it can save your life and how it can be a lifelong activity. For water rescue activities, I posit that knowing how to tread effectively is the most useful water skill to have. In my speech "The Eggbeater Kick", I demonstrated, sans water, how this technique is done. Is there a reason swimming isn't popular? I suppose it boils down to finances. Only the middle to upper class families can afford to send their kids for private swimming lessons. The rest, which is the bulk of the population, can't. Swimming isn't normally taught in elementary and high school and very few colleges offer swimming as a P.E. subject. If you will inquire to Milo swimming school the basic cost is Php 3,500 and that means a lot to filifinos nowadays, most of them can't even afford to send their kids to public schools.